Propolis (bee glue) is a well known natural product with healing properties. The chemical composition of propolis is highly variable and depends mainly on the local flora. As a part of a systematic research on bee-keeping products, two propolis samples from Kyrgyzstan and Kazakhstan have been studied for the first time due to their high and very interesting flora. Chemical analysis of propolis samples was performed by GC/MS which is a very useful and highly appreciated analytical tool, after silylation procedure1. The results showed that both samples contain mainly aromatic acids (cinnamic, caffeic and ferulic acids), esters of phenolic acids (pentenyl and phenylethyl caffeates), flavonoids (galangin, pinocembrin, pinobanksin) as well as chalcones of pinostrobin, pinocembrin and alpinon. These results confirm a typical chemical profile characteristic for Temperate zone propolis2 while in both cases appear also an uncommon aliphatic acid content (oleic, linoleic, palmitic and stearic acids) . Furthermore, both samples showed a high TPC (total phenolic content), determined by the Folin-Ciocalteu method. Additionally, the ethanolic extracts were evaluated for their antimicrobial activity, by the agar dilution technique against a panel of human pathogenic microorganisms. The assays revealed broad spectrum of antimicrobial activity specified against Gram positive bacteria as well as against oral pathogenic ones. 1. Popova Μ., Chinou Ι., Marekov Ι. and Bankova V. (2009). Terpenes with antimicrobial activity from Cretan propolis. Phytochemistry, 70: 1262-1271. 2. Bankova V., De Castro S.L., Marcucci M.C. : Apidologie 2000, 31, 3-15. ISNAD PETROPOULOU, Argyro , GRAIKOU, Konstantia , WIDELSKI, Jaroslaw , SKALICKA-WOŹNIAK, Krystyna , SAKIPOVA, Zuriyadda , CHINOU, Ioanna . "Chemical Composition of Selected Propolis Samples from Kyrgyzstan and Kazakhstan". 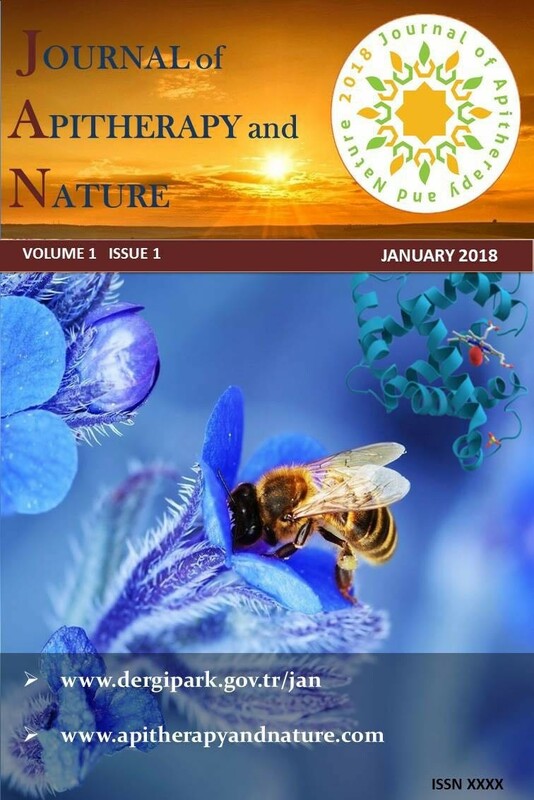 Journal of Apitherapy and Nature 1 / 3 (December 2018): 62-62.